Friday’s ad is from Pabst, from 1906. Many brewers made other related products besides beer, notably malt extract, to be used primarily in cooking as an ingredient in breads and desserts and even as a tonic. According to Briess, which still offers it today. “What is Malt Extract? Malt can be further processed to produce liquid or dried sweeteners called Malt Extracts.” They were essentially “the original starch- or grain-based sweetener.” Many brewers survived prohibition making malt extract, both for legal uses and for homebrewing, but Pabst was making and advertising decades before. In this ad, they ask, essentially, have you ever been really, really sick? To the point where you weren’t sure if you’d pull through? 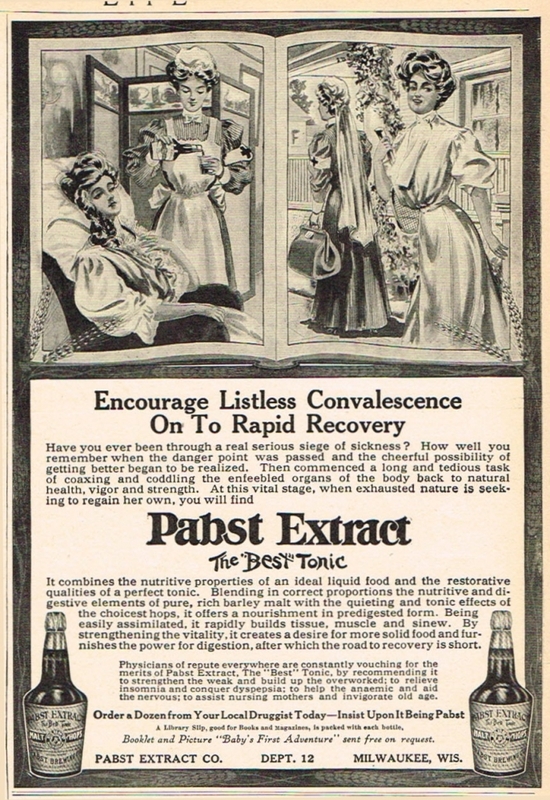 Well if you’d regularly used Pabst Malt Extract the road to recovery would not only be more assured, but quicker, too.